Matthew B. Free has concentrated his career on appellate practice, involving cases of medical malpractice, insurance defense and coverage, bad faith liability and municipal liability. His primary focus includes extensive research and brief writing, oral arguments and motion practice. 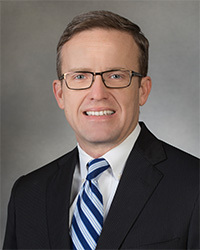 He is the attorney of record in 26 decisions published by the Tenth Circuit Court of Appeals, Oklahoma Supreme Court and the Oklahoma Court of Appeals. While in law school, Matt served as assistant managing editor of The Oklahoma Law Review and authored ‘Kraszewski v. Baptist Medical Center of Oklahoma, Inc. — The Oklahoma Supreme Court recognizes the Tort of Intentional Infliction of Emotional Distress in a New Context,’ 51 Okla.L.Rev. 403 (Summer 1998). Mr. Free has also authored ‘The Oklahoma Supreme Court Rejects Social Host Liability,’ 74 O.B.J. 847 (2003), as published by the Oklahoma Bar Journal. Mr. Free is a member of the Oklahoma Bar Associations, Defense Research Institute and Oklahoma Association of Defense Counsel. He is past chair of the Appellate Practice Section of the Oklahoma Bar Association. Kraszewski v. Baptist Medical Center of Oklahoma, Inc. – The Oklahoma Supreme Court recognizes the Tort of Intentional Infliction of Emotional Distress in a New Context,’ 51 Okla.L.Rev. 403 (Summer 1998). The Oklahoma Supreme Court Rejects Social Host Liability, 74 O.B.J. 847 (2003). Overview of 2007 Oklahoma Supreme Court Opinions, Appellate Practice Section of the OBA. Aguiar v. Bartlesville Care Center, 2011 WL 1461541 (10th 2011).